Woohoo! We're going to Krusty Burger! Carry it home to your place! Woohoo! We're going to Krusty Burger! Then again, maybe not. 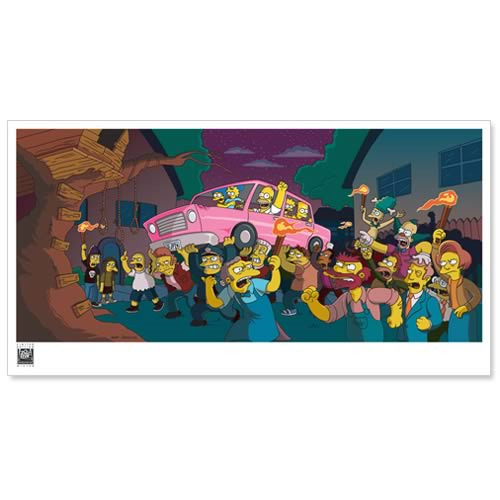 This riotously funny publicity image from The Simpsons Movie shows the Simpsons family being carried away by an angry mob. Limited to only 195 pieces, this fine-art giclée is printed on 13-inch tall x 19-inch wide archival paper, with an actual image size of 8-inches tall x 17 1/2-inches wide. "Angry Mob" comes with certificate of authenticity. Quick! Carry it home to your place right away!